Amal Basha is a human rights activist, who supported the 2011 Yemeni Revolution, reporting violations and crimes to the international human rights and media community from the square. She was elected a member of the Revolutionary Council in 2011 and later served as the official spokesperson for the twenty-five member National Dialogue Committee. 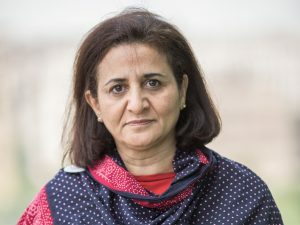 Amal has worked for both national and international organizations, advocating to end impunity for crimes against humanity, war crimes, and genocide. In 1999, Amal co-founded Sisters Arab Forum for Human Rights (SAF), one of the leading human rights advocacy organizations in Yemen. She has received several awards including the Shield of the Person of the Year in 2008 from the Al-Sa’eed Foundation for Science and Culture in Yemen. SAF has continued its vital work in through the civil war, currently working to ensure women will be active participants post-conflict.